A distributed flow routing model for river discharge simulation. The model structure is the same as 1K-FRM, but Input data to 1K-FRM-event is an event based hourly data. Input data is supporsed to be runoff generation intensity. [IMPORTANT] Topography data must be generated by hydroshed2topo ver. 1.30 or higher. A distributed flow routing model for river discharge simulation. Input of the model is monthly sorted hourly runoff generation intensity, which is supposed to be provided by the MRI 20km GCM output for analysing the change of future river dishcharge under climate change scenario. 1k-frm with dam operation. This program enables to include observed dam outflow data. Also it has a member function to realize dam operation and simulate dam outflow. Input data is supporsed to be runoff generation intensity. A distributed rainfall-runoff model for river discharge simulation. The model structure is the same as 1K-FRM-event, but discharge-depth relationship considering subsurface flow is included. 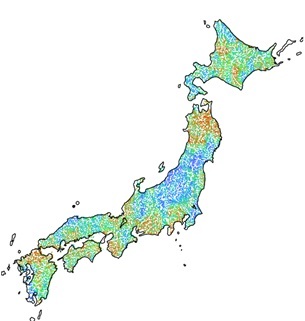 Input data is supporsed to be rainfall intensity. A dam operation model is included in version 1.35. For default setting, dam operation is not included. A dam model is included by changing the source code of the main program and the progmam implementing member functions. A distributed rainfall-runoff model for river discharge simulation. The model structure is the same as 1K-DHM-event-ver1.X, but structure of slope and river channel components are newly defined. 1K-DHM-event-ver2.X is capable to include river channel component in upstream cells. Input data is supporsed to be rainfall intensity. A dam operation model is included in version 2.X. For default setting, dam operation is not included. A dam model is included by setting parameters of dam model in the dam configuration file. member functions. A reservoir model is included from version 2.22. The behavior of reservoirs is represented by a liner reservoir model. For default setting, reservoir is not included. A reservoir model is included by setting a parameter of a liner reservoir model in a reservoir configuration file. A distributed rainfall-runoff model for river discharge simulation. Input data is supporsed to be rainfall intensity, snow melting intensity, evaporation and transpiration intensity. A topography data processing program for 1K-FRM, 1K-DHM, 1K-FRM-event, and 1K-DHM-event. [IMPORTANT] Topography data generated by ver. 1.30 is applicable for 1K-FRM and 1K-FRM-event ver. 1.30 or higher. Input data ver. 1.00 for hydroshed2topo (90MB zip file including sample data of elevation and flow direction for Asia, which was generated from HydroSHED). A program to extract forcing data from MRI-AGCM 3.1S and 3.2S. pointdata-event-ver100: A program to extract hourly time series data from output hourly discharge simulated by 1K-DHM/FRM(-event) version 1.X file for 1K-FRM-event. pointdata-event-ver222: A program to extract hourly time series data from output hourly discharge simulated by 1K-DHM-event version 2.22 file for 1K-FRM-event. pointdata: A program to extract daily time series data from output discharge file for 1K-FRM. makeppm-event: A program to generate PPM image files from output hourly discharge file for 1K-FRM-event. extractBasin: A program to extract a basin of specified column and row number. modHydroshed2topo: A program to generate topography data for 1K-FRM, 1K-DHM, , 1K-FRM-event, and 1K-DHM-event. This program is used when a generate topography data by hydroshed2topo needs to be revised. The program uses a modified flow direction data. point2dist-event: A program to generate a distributed rainfall dataset from point data. averageRain-event: A program to generate a time series of precipitation averaged over an entire catchment for 1K-DHM-event. averageRain: A program to generate a time series of precipitation averaged over an entire catchment for 1K-DHM.